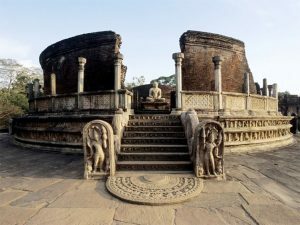 Sri Lanka travel guide, including map of Sri Lanka, top Sri Lankan travel experiences, tips for travel in Sri Lanka, plus leopards, temples and tea. Hanging like a tear-drop from the southern tip of India, Sri Lanka is one of the most beautiful countries in the world. Ringed by a necklace of palm-fringed beaches, its mountainous interior rears up in a jungled hinterland roamed by elephant and leopard, rising finally to the cool highlands that grow the country's famous tea. Amidst all this there's culture too. Overwhelmingly Buddhist, Sri Lankans practice their gentle beliefs with a lavish enthusiasm. There are thronged temples and sacred relics, religious festivals and extravagant sacrements, at their most spectacular in the holy city of Kandy, home to the Buddha's tooth. History lives on in the steep, lushly forested hills. This is where you'll find the mighty rock-top fortress of Sigiriya and a cluster of historic towns, including Anuradhapura and Polonnaruwa. The colonial era brought tea-planting on a massive scale to Sri Lanka's cool highlands. You can visit the bungalows of early British settlers as they sit amongst seas of tea-plants, watch pickers at work and factories in action. Walk the streets of Nurweya Eliyah and think Ascot, with timber-framed buildings, G&Ts at members' clubs and even a horse-racing track. European cultures blend in the southern city of Galle, with Portuguese and Dutch elements in this fortified outpost overlooking the Indian Ocean. To see leopard and elephant in the wild there are a number of spectacular National Parks, lushly overgrown in the tropical climate: Yala is perhaps the most visited. Skilled guides point out the smaller wonders: a huge variety of birdlife and brightly-coloured jungle butterflies. Last, but not least, there are beaches galore. Pick your beach to suit the season and your taste. There are quiet beaches while others catch great surfing waves. For a beach experience true to local life head to the south, where fishermen perch on stilts dug into the sand, casting lines into the ocean for their daily meal. The Esala Perahera festival in Kandy has a long and loud procession so be sure to get a seat. Restaurants and shops along the route sell ticketed seats: book early. Money in Sri Lanka: Sri Lankan rupee (LKR රැ). Credit cards and travellers cheques are widely accepted. There are ATMs in major cities. Sri Lanka has two monsoons. The south, west and the hills are driest from December to March, while the dry season in the north and east runs from April to September. It’s generally warm all year, but far cooler in the hills. The dates of the Kandy Esala Perahera festival are based on lunar cycles, but the ten-day extravaganza is always in July or August. To see the elephants at Minneriya, visit from July to September. Bandaranaike (CMB) is 29km from the city. Public transport in Sri Lanka is cheap but crowded. Rickshaws ply the main towns. Driving is chaotic – better hire a car and driver, at around USD 50 a day, instead. Trains and buses serve main destinations around the island. Cycling is a great way to explore. Prices are seasonal in Sri Lanka so it’s always worth asking for a discount outside peak times. Dormitory-style hostels are rare in Sri Lanka. Budget travellers are more likely to find room in hotels or guesthouses. Boutique Hotels are more suitable for small groups. Home stay is a new concept. Large resort hotels cater to package tourists. Some camping is available in the national parks. In Sri Lanka’s hill country, check out the lovely tea estate bungalows. Meals involve a mountain of rice surrounded by curries, spiced vegetables, salads and pickles. String hoppers – pancakes of noodles - are local specialities. Vegetarians will thrive. Try a thambili (king coconut) – the juice is a refreshing hangover cure if you’ve overindulged in arrack, the local coconut tipple. Most areas of Sri Lanka are now safe for travellers but check with the Foreign Office for the latest security information before you pick a route into the north. Ask your GP or travel clinic about malaria prophylaxis and make sure you’re up to date on other vaccinations. Drink only bottled or sterilised water.